A Short History of My Interest in Organs – Updated Below as of Feb. 2019. Organs, electronic or pipe, have fascinated me since childhood. 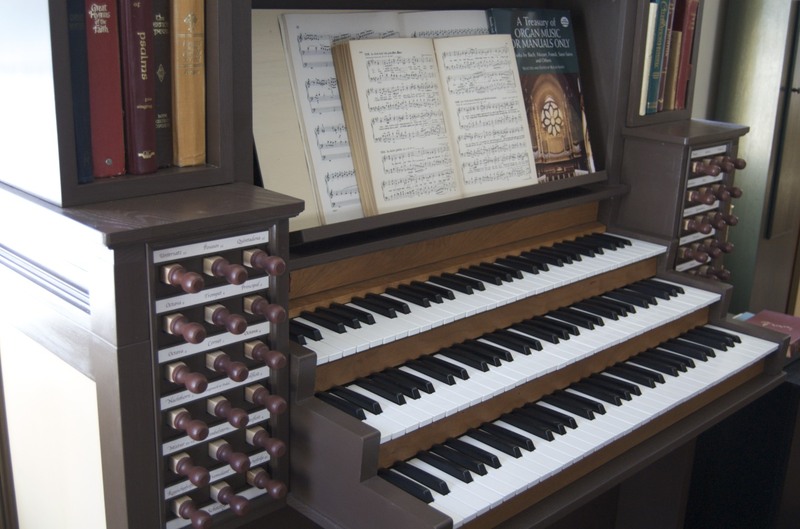 During my High-School years I had access to a small Baldwin organ at our church; occasional access to a small Hammond (drawbars and all) at the Town Hall/Masonic Lodge; and occasional access to a real pipe organ arranged by my piano and organ teacher. At one time I owned and (sort of) restored an old reed organ and longed to get access to a very large reed organ in an older church nearby, which unfortunately I was able to play only once. 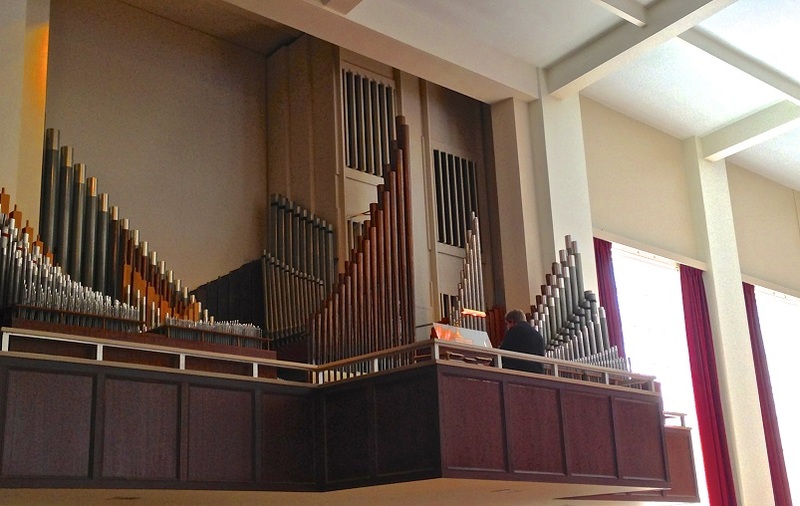 During my college years at Houghton College, I had access to some older electronic practice organs, a mostly restored (but finicky) pneumatically controlled Moller pipe organ, and once (but only once!) I had the opportunity to play the large Holtkamp pipe organ in the chapel, normally reserved for organ majors only. I was not a music major, though I was privileged to have two semesters of organ instruction under Dr. Charles Finney mostly on the pipe organ at the nearby Wesleyan church. At some point while I had the Allen C-3, I learned about a small company called Crumhorn Labs that was developing the concept of using software running on a powerful personal computer to play back pre-recorded sounds of real organ pipes. I tried their demonstration program, but was initially disappointed to find that the most powerful computer to which I had access was only minimally able to run the software. At the time, the cost of a more powerful computer seemed to place this promising concept far out of reach, so for practical reasons it was back to the Allen C-3 for many years with occasional access to a real pipe organ. My wife and I also purchased a Kwai electronic piano that had some fairly credible, though limited, pipe organ sounds. Although the Allen remained playable for many years, it was eventually dismantled due to concerns about the deteriorating condition of its line-voltage wiring and its safety. I saved the keyboards, pedalboard and stop controls for possible future use. Fast forward to about 2009 when I stumbled onto Hauptwerk, a commercially available software program that had grown out of the initial work by Crumhorn Labs. I was excited to realize that Hauptwerk would actually run on my home computer, a rather humble PowerPC Mac. For my first Hauptwerk organ, I used the Kwai pianos MIDI enabled keyboard, the PowerPC Mac, and some computer speakers to cobble together a system, which although very limited, was non-the-less very satisfying. Shortly after this I MIDI-fied the old Allen pedalboard and added it to the setup. Clearly Hauptwerk opened up all kinds of possibilities. Over the next few years I assembled a credible, though hardly ideal, organ using three M-Audio keyboards, the old Allen pedalboard and original tabbed stop controls. The components were first stacked on a table, then eventually housed in a rough painted plywood case that could be easily modified as I explored various options. After making a decision that I preferred a more or less Baroque type case, the organ looked something like the photo shown to the right. Unfortunately I do not have any photos of earlier ‘models.’ At this point I had a pair of M-Audio BX-5 monitor speakers and a Behringer subwoofer just visible to the right. The computer was located just behind the music rack which was hinged to pivot upward for access. Sometime early on in the process I decided that I did not want to pursue touch screens for the stop controls even though they are in may ways very flexible and practical. The stop controls shown here were the result of several attempts at making stops that looked and functioned like those on old Baroque organs. The process of making them is described here. 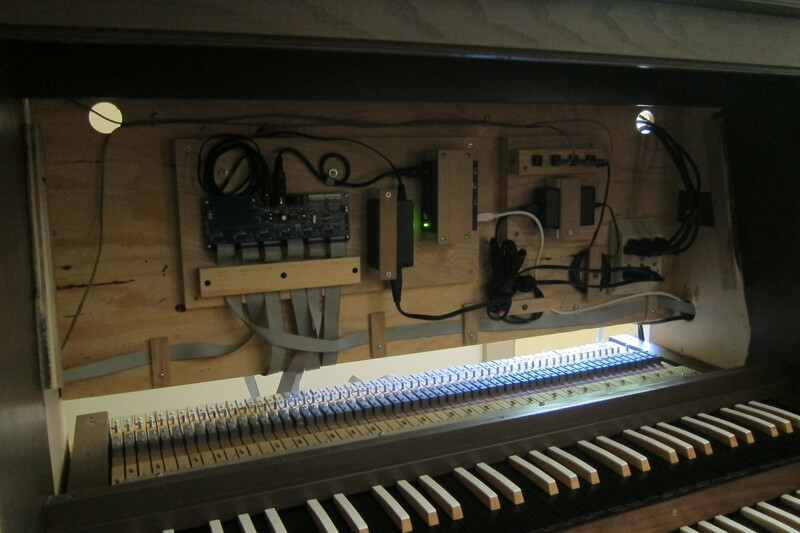 The case has been modified many times since the initial construction in order to try out various projections for the keyboards, moving the stop controls up or down for the best access, or to re-arrange internal components. The photo far below shows the current configuration. 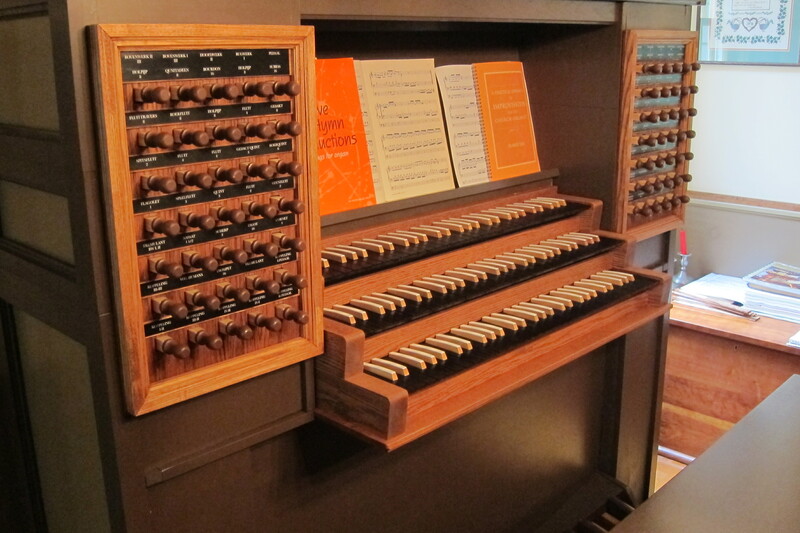 The M-Audio keyboards have been replaced with used midified pipe organ keyboards, additional stop controls have been added along with a new shop-built pedalboard. The keyboards, pedalboard, and stop controls are connected to a Midi Gadgets Boutique hwce-max board which has been very reliable and easy to configure. Nearly all of the control boards are located directly behind the music rack (currently removable, to be hinged in a future cabinet.) I chose to locate the controls here as I’m aware that the final case will probably be too heavy to move easily if were I to need future access to components from the back side. 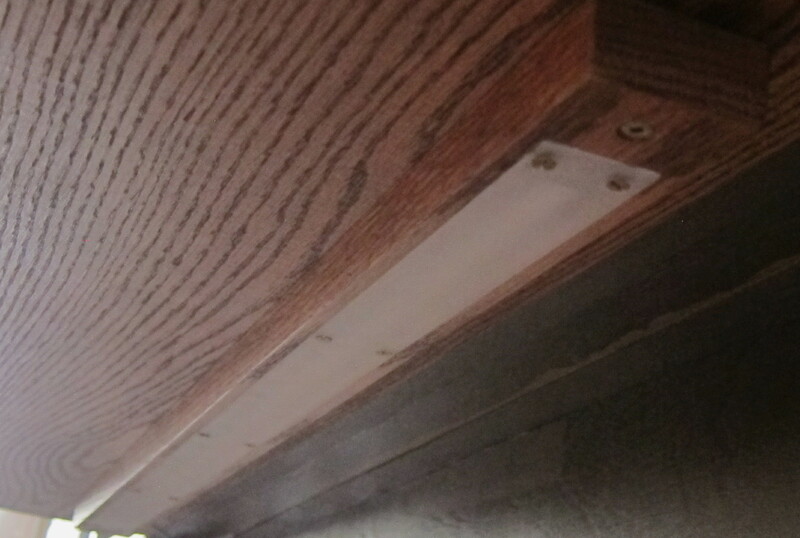 The music rack, keyboard, and pedalboard are illuminated by strips of warm white LED strips obtained from AllElectronics.com (catalog number CAT# LS-12-WW) and mounted into a shop-made wooden strip with a frosted plastic face to help disperse the light. The intensity and color of the light is very acceptable. In the photos, the painted case looks fairly acceptable, but in reality the paint hides the fact that the entire case is cobbled together, now face screwed in many locations, and is full of patched leftover holes where cables were originally routed, etc. By nature a virtual pipe organ is never really finished (and that’s part of what makes it such a cool project!) The current organ already is far more that I had ever hoped to have, and the potential for further refinement is ever present. My thanks to Milan Digital Audio for Hauptwerk which is a truly magnificent software program; to the various companies that provide such excellent sample sets; and to the many Hauptwerk Forum members for the incredible wealth of information that has been so helpful. I hope these pages will be of help to others as they construct their own VPO. For those who are interested, the organ is usually loaded with Volume 3 of the 1741 Albertus Anthoni Hinsz organ although I also use the 1680 Arp Schnitger, 1721 Gottfried Silbermann, or the 1719 Magnuskerk Anloo organs. Of course, there are many others that could be loaded…funds permitting! 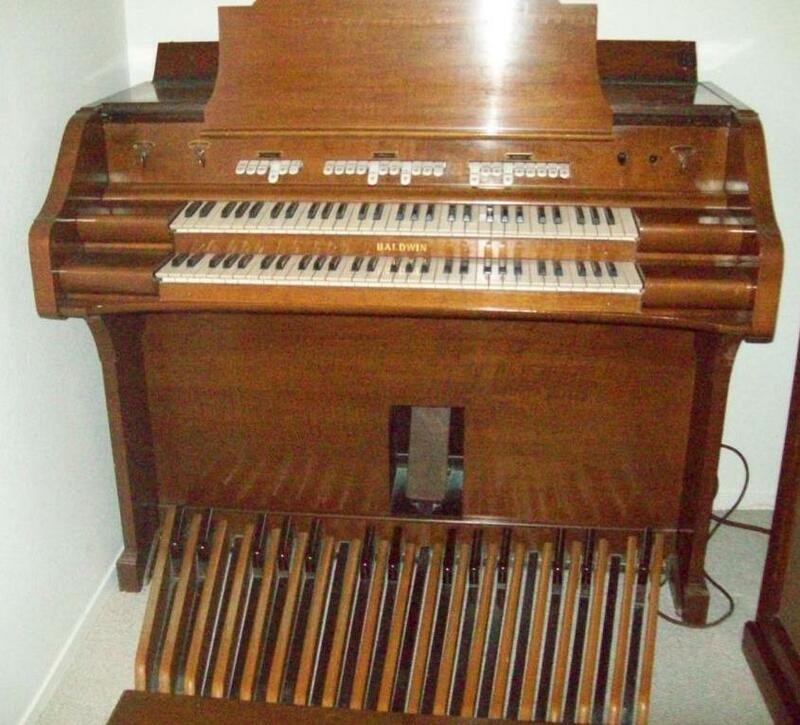 The above Hauptwerk organ served me well for several years, but as plans were made for a retirement house, it became clear that I would not have a space large enough to adequately house a larger more Baroque-like console. After much consideration, I decided that my best option for a smaller space would be to construct a console that was lower, painting it off-white in the Colonial tradition so that it would blend into the room better and have a more gentle visual impact on the space. With the decision to work with a smaller console, I also decided to explore the use of Launchpads (as frequently mentioned on the Hauptwerk Forum) for stop controls since the Baroque-style stops were simply too large for a smaller console. After trying several options for labeling the stops for my sample sets, I opted to follow the vellum paper route also mentioned on the Forum. For durability, I found that it was possible to print the stop labels, coat the vellum sheets with a light coat of spray lacquer (available in most hardware and paint stores) and mount them in a cream colored flat surfaced mattboard (like those used for mounting photos) using either spray adhesive, or rubber glue. The mattboard was also given a light coating of lacquer prior to mounting the vellum. The stop controls are proving to be very readable, and durable, and very cost-effective for number and function compared to working stops (which, though very desirable, were well outside my budget.) The vellum can be damaged slightly by pressing with fingernails rather than fingertips, but they are also easy to replace as needed. They are held in place by a wood surround with magnets that are attracted to screws on the console. I also made several updates to the sound system and the internal arrangement of the various components, first in a re-worked temporary console, and then last winter in a finished console as shown below. The keyboards are from CMK, pistons from Klann, and the pedalboard is the one described on this site. Most of the internal MIDI components are from Midi-Boutique. The monitor is mounted directly behind the glass music rack and has worked well in this location. It is readily visible when needed, but normally well behind the music and very unobtrusive; it can also be turned off entirely except when required for updates, configuration, etc. At some point I intend to post further information both here and on the Hauptwerk Forum describing the console and its internal layout, but do not have time to do so presently (since we are still working on the retirement house – an unexpectedly long process compared to prior houses!) For the moment, please feel free to post comments or ask questions below if you would like additional information and I will try to respond as soon as possible. The additional labels to identify the various divisions are printed separately and glued to the face of the mattboard. Having used the above console for a couple of years, I found myself still wanting to pursue my original goal of a more Baroque-style console. The room in which my organ is placed is relatively small (about 11 x 13′) and originally I wasn’t sure it would support a larger console. But after looking at the above console in place in our new house and the speakers mounted above it on a high shelf, I decided that a larger console that contained the same speakers might work just as well. I also painted it the same color as the walls to help it blend in better. It certainly dominates the corner of the room, but doesn’t take up any more floor space. New Baroque-style console. There are four speakers in the upper part of the console, and I’ve found that because they are ducted-port I have to keep the cabinet about 4-6″ away from the wall, otherwise the sound quality is compromised. The sub-woofer sits just to the right, and four smaller speakers are located high up on the wall opposite the organ. All things considered, the sound quality seems very good for the room size. The monitor sits behind a glass music rack and is readily accessible when needed just by pushing the music to the sides. The stop controls are similar to those I have made in the past, but with some significant improvements described here.